The Center for Learning and Memory at The University of Texas at Austin is a basic neuroscience research center that marshals the collective expertise of premier neuroscientists from diverse disciplines to unravel the mechanisms that govern learning and memory and cognitive disorders. 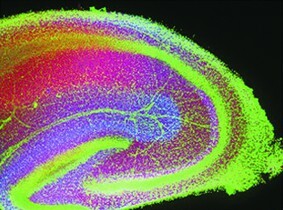 Research spans the fields of neurobiology, molecular biology, genetics, physiology, behavior, physics and computer science. The Center promotes the exchange of ideas and expertise across different disciplines and levels of analysis (from molecules to organismal behavior) while specifically focusing on understanding how we learn and remember things. The Center represents a bold new opportunity for the future of learning and memory research. It is a place where progress towards understanding learning and memory is limited only by the imagination and skill of our faculty.